MOUNTAIN VIEW, Calif.--Today eHealth, Inc. (NASDAQ:EHTH), which operates eHealth.com, the nation’s first and largest private online health insurance exchange, published results from two voluntary email surveys of eHealth customers who purchased Obamacare-compliant major medical health insurance plans through eHealth.com. However, between November 2016 and January 2017, support for the repeal of the Affordable Care Act (also known as the ACA or Obamacare) has dwindled, and health insurance consumers are concerned about the future of health reform. Over 4,400 eHealth customers who were enrolled in an Obamacare health insurance plan completed the survey in November 2016. Over 1,200 additional respondents completed the survey in January 2017. The survey asked a series of questions to gauge Obamacare enrollees’ feelings about the Affordable Care Act and asked respondents to report if they had received Obamacare subsidies (also known as advanced premium tax credits). "Do you support President-elect Donald Trump's plans to repeal and/or replace Obamacare?" "Which of the following sentences best expresses your feelings about the cost of your health insurance plan?" "People should get to choose the benefits they want covered by their health insurance plan." "People should be able to buy a health insurance plan that doesn't cover maternity care." "People should be able to buy a health insurance plan that doesn't cover brand name prescription drugs." "People should be able to buy a health insurance plan that doesn't cover pediatric services." "When it comes to ‘Trumpcare,’ what issue are you most interested in or do you have the most questions about?" "People should not be denied health insurance because they have a pre-existing medical condition." "No one should be legally required to buy health insurance." "No one should pay a tax penalty for being uninsured." "Adult children should be able to stay on their parents' health insurance plan until age 26." These survey results are based on a voluntary nationwide email survey of eHealth customers conducted between November 22 and November 23, 2016, and again between January 19 and January 20, 2017. More than 4,400 responses were collected in November 2016 and an additional 1,200+ responses were collected in January 2017. All survey requests were emailed to individuals who had purchased an individual or family health insurance plan through eHealth.com, eHealth’s non-government health insurance marketplace. The survey asked respondents to self-report whether or not they received advanced premium tax credits (Obamacare subsidies). Some of the wording and formatting of survey questions and answers were paraphrased or otherwise modified for readability and presentation in this press release. *Percentages may not add up to 100% due to rounding. eHealth, Inc. (NASDAQ:EHTH) owns eHealth.com, the nation's first and largest private online health insurance exchange where individuals, families and small businesses can compare health insurance products from leading insurers side by side and purchase and enroll in coverage online. eHealth offers thousands of individual, family and small business health plans underwritten by many of the nation's leading health insurance companies. eHealth (through its subsidiaries) is licensed to sell health insurance in all 50 states and the District of Columbia. eHealth also offers educational resources and powerful online and pharmacy-based tools to help Medicare beneficiaries navigate Medicare health insurance options, choose the right plan and enroll in select plans online through Medicare.com (www.Medicare.com), eHealthMedicare.com (www.eHealthMedicare.com) and PlanPrescriber.com (www.PlanPrescriber.com). 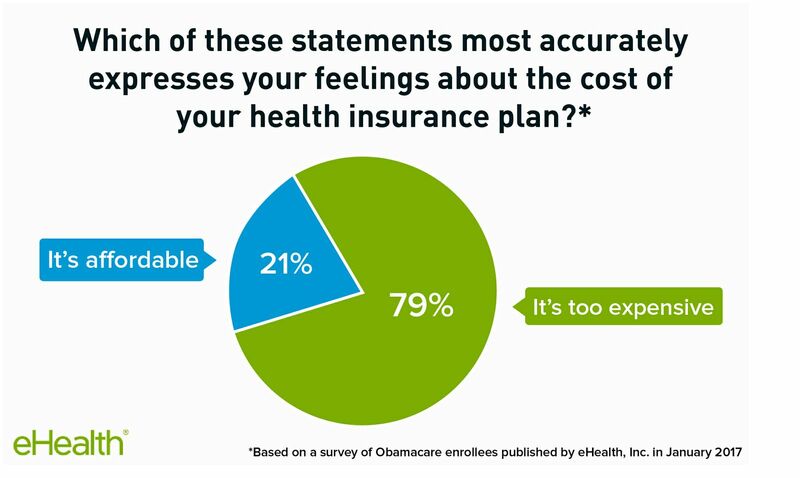 79% of Obamacare enrollees say coverage is too expensive. 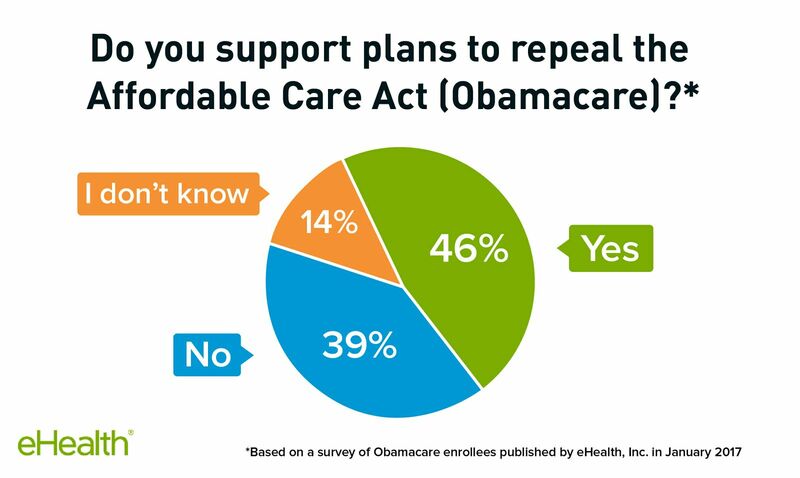 Nearly half of enrollees support the repeal of Obamacare.